In my experience “Web 2.0 technologies” traditionally haven’t been well understood, therefore are either ignored entirely, poorly implemented (i.e. become a push communication tool rather than a way to engage conversation) or get banned totally. What makes social media work at work? That in itself is a much larger discussion. And having an army of Gen Y social media fantics isn’t always the answer. It’s different for every organisation. Having spent most of my career working in the technology space, I’ve found adding internal social media tools into the mix tends to be adopted much faster and with less issues than in non-geek workplaces. I’ll be the first to say it, us geeks love our toys and online collaboration is a native concept in the geek-verse. It’s also important to have policies that support positive social media use. I did a short contract with Telstra a few years ago and they are the first company that I’ve worked with that I think actually handle employee social media usage well. Telstra get their contract, casual and permanent staff to complete a compulsory online module about their social media policy. Their approach is realistic, pragmatic and extremely simple to follow. Their full social media policy is six pages; it’s pretty comprehensive while keeping things concise. When you think about it, it really is just common sense. If you look at other large organisations who have embraced social media as part of their large employee engagement strategy, they all have simliar themes. 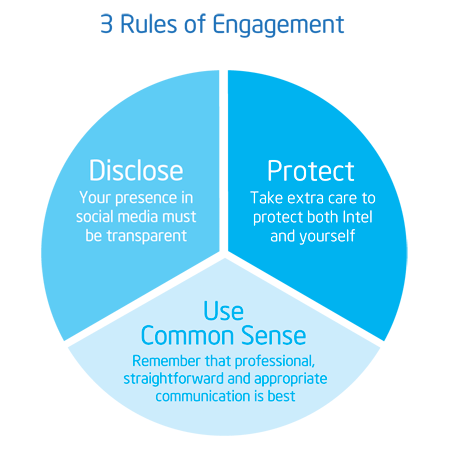 Intel have a simliar three principle model approach and like Telstra offer additional online training and opportunties for employees who want to be “officially” part of the online coversation about the company. Mashable were talking about the need for company social media policies back in 2009; they posted a series of articles talking about the potential HR issues, how to shape such a policy and a simple 10 Must-Haves for Your Social Media Policy. Does your company have a social media policy or are they still being anti-social about the whole conversation?